A drive shaft transmits torque and rotation and usually connects components in a drive train. Cars use a shaft to deliver power from a differential or transmission to the wheels. 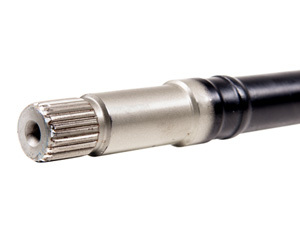 B&F manufacture splined drive shafts in a variety of materials that can be hardened and often powder-coated. Many of these are manufactured for the vintage or classic vehicles restoration industry and so supplied in small and lager batch quantities.